Lately I’ve been receiving a lot of requests from readers for wine suggestions that are both inexpensive (sub $13 on the shelf) and widely distributed. This poses a challenge for me as I find that wines that meet those criteria are typically uninteresting at best, and in most cases are simply bad. It’s not that I’m being a snob (ok maybe I am a little), but to be both inexpensive and available in a vast majority of markets you’re talking about significant case production. These are typically not wines that were made through a labor of love, they were made in a glorified wine assembly wine. There aren’t generations of growers and winemakers standing behind them, there are corporations. However, as with everything in life, there are exceptions to every rule. There are some good, family run, inexpensive wineries out there that have a moderate to strong market presence… There aren’t many, but there are some. Names that pop immediately to mind are wineries like Sean Minor: Four Bears out of California, Powers Winery out of Washington State, Mas de Daumas Gassac Guilhem from the Languedoc in France, wines made by the Botter family throughout Italy… and Crios from Argentina. Crios is the third tier of what I affectionately refer to as the Susana Balbo Empire, officially known as Dominio del Plata. Susana Balbo began her journey in 1981, when she earned her degree in enology and began working as the winemaker for a winery in Cafayette. She quickly proved that her winemaking abilities, and passion, were exemplary and her talents were almost immediately in high demand throughout Argentina. It didn’t take time for word to spread through the wine world and Susana became the first Argentine winemaker to ever be hired to consult at wineries outside of Argentina. To date she has consulted at wineries in Australia, Brazil, California, Chile, France, Italy, South Africa and Spain. By the mid-1990’s Susana was widely considered to be one of the preeminent female winemakers in the world. In 1999 Susana finally decided it was time to make wine for herself rather than others, and the Dominio del Plata winery was born. Under the DDP umbrella she has four labels. Susana Balbo Signature (which are her flagship wines), BenMarco, Crios and Bodini. The thought process behind creating Crios was twofold. Stylistically her vision for Crios was to make wines from her younger vines that were inexpensive and meant to be consumed early. More importantly, however, was the family aspect of Crios. The label was created as a collaboration between Susana and her two children, Jose and Ana Lovaglio. Crios was her way to teach them the family business, and this is why the label portrays a large hand encompassing two smaller hands. Luckily Jose and Ana quickly took to the world of wine and decided that wine was their path, Jose as a winemaker, and Ana as an operations and marketing manager. In fact, they’ve become so adept that as of 2011 Susana handed Crios over to them. A number of wines are produced under the Crios label, including Cabernet Sauvignon, Chardonnay, Malbec, Rose of Malbec, a Syrah/Bonarda Blend, and Torrontes. While all of the wines are extraordinarily good for the price, and I would recommend all of them in an instant, the Torrontes is the wine that resonates the most with me. 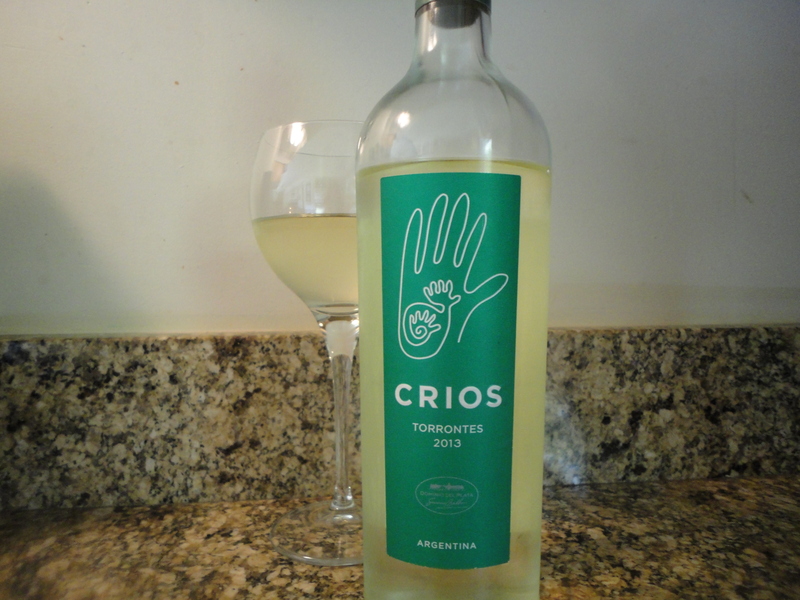 Torrontes is a white grape varietal that is indigenous to Argentina. There are white wines made in northwestern Spain that are labeled under the named Torrontes, however, it has been genetically proven that they are not related to the Argentine strain. Torrontes from Argentina tend to be extremely aromatic in the bouquet, and unfortunately this often translates on the palate as well, leaving one to feel as if they just swallowed soap or perfume… not exactly pleasant. Futhermore, a vast majority of Argentine Torrontes are very fat, meaning there is no acidity or minerality to cut through the palate adding complexity and structure. Crios Torrontes, however, is the exact opposite, and that is why I find it to be so wonderful. In the glass you’ll find a pale yellow wine with faint pale green hues along the edges. The bouquet is very typical for a Torrontes, being extremely aromatic with redolent notes of white peach, Meyer lemon and crushed white flower. It is on the palate, though, where Crios differentiates themselves from the glut of unappealing Argentine Torrontes. There you’ll find a dry crisp wine with subtle acidity and almost chewy minerality, with notes of slightly underripe pineapple, Bosc pear and lemon zest, completed by a long lingering finish that hints at salinity and anise. I find that this wine is best as an aperitif, or paired with raw shellfish, sushi/sashimi, or spicy foods (especially Japanese and Thai). It is absolutely ideal for sitting poolside, one of my favorite summer quaffers! One of the best parts is that with 30,000 cases produced annually it is easily found in most markets throughout the world, with a typical retail price of $10-13. The wine is currently on the 2013 vintage, to which I am giving a score of 90 points. Well done Susana, Jose and Ana! So there you have it, my newest wine review. I hope you enjoyed the read and I hope that you’ll go out and buy the wine. As always, new content is coming soon, in the meantime crack open a bottle of Crios, sit back, and relax. Life is short, enjoy it! Tags: argentine wine, crios, crios torrontes, dominio del plata, perfect pairings, perfect pairings at home, susana balbo, torrontes. Bookmark the permalink. Love this review. I drank the 2015, but I found this description to perfectly capture what I’m tasting.